Looking back at the past month, I've been so busy with work and planning our trip (more on that later) that I haven't really paid much attention to what I've been using makeup and skincare wise before writing this. Here are a few of my standout products from the past month. Ohhhh my goodness. I've heard the hype about these products for a long time, but I brushed it off (see what I did there? ), because shampoo is shampoo, right? Also, it's against my principles to pay R250 for a bottle of shampoo and R280 for a bottle of conditioner. But when RetailBox sent me a gigantic gift voucher to use in their store, I jumped at the chance. I bought this on a whim at the Beauty Festival as my previous (expensive) serum was finished. The serum contains something called Matrixyl 3000 that targets wrinkles, and Hyaluronic acid to hydrate the skin and reduce redness and inflammation. The serum has a very light texture and a faint floral scent. It sinks into the skin immediately and isn't tacky or greasy. I can't really say whether this has improved the appearance of my skin or not, but with ingredients such as Hyaluronic acid, I can't think that it could be anything but good for my skin. The pump bottle is also very handy and hygienic, but isn't very travel friendly. You can buy this from Woolworths for R280. Catrice Gradation Blush in "C01 Waterloo Sunrise"
I have a lot of love for Catrice products: good quality, good value for money, on trend colours and products. This particular blush is from their limited edition Crème Fresh range. Looking at all the pastel colours (think mint green, blue, yellow, and pink), I think this range is geared towards the Northern hemisphere's summer, but this blush was just too pretty to resist. It comes in quite a big compact, but is still thin enough to pop in your handbag. And look at that gradient! 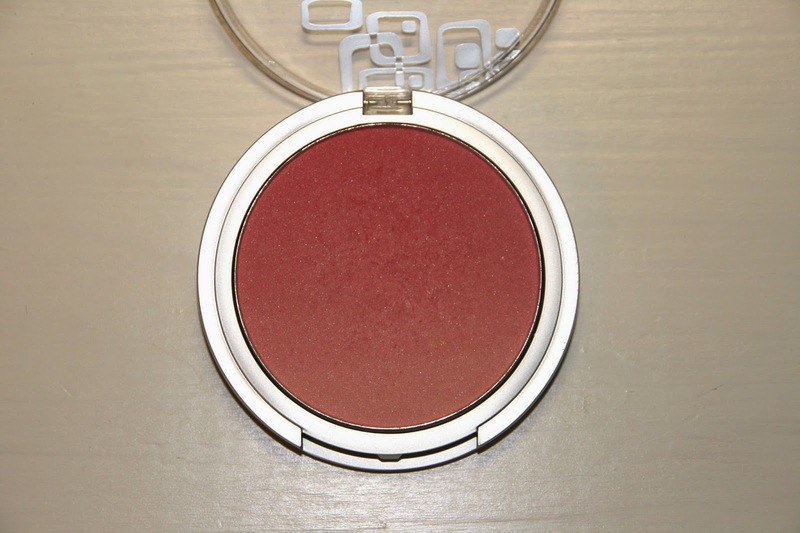 The powder blush is light pink at the bottom and gets progressively darker towards the top. It's a beautiful bright pink that instantly brightens the cheeks without leaving you looking like a clown. You can buy this at Dischem, but I can't remember the price. 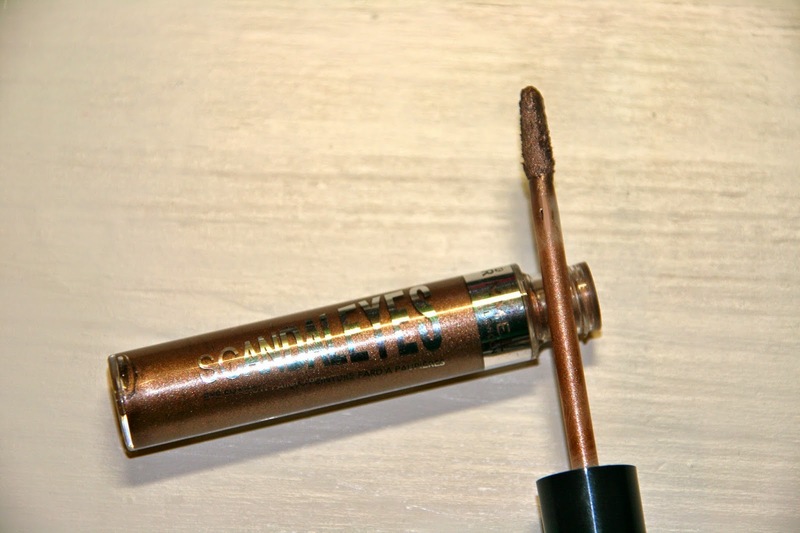 Rimmel ScandalEyes Eyes Shadow Paint in "Rich Russet"
I read about this on All Dolled Up last year when it wasn't available in South Africa yet. It has been on my wishlist for a few months and I was very excited when I saw it at my local Dischem. It's the same concept as the eyeshadow sticks, except this is in liquid form. The doe foot applicator lets you "paint" the eyeshadow onto your lids and then blend it out before it dries. The colour is a beautiful bronze rather than an actual russet colour. When blended out it looks a bit more brown, but it's a very beautiful colour. I either use it on its own or under normal eyeshadows. The staying power is, in my opinion, better than that of the ScandalEyes Shadow Sticks. It creases after about six hours, which is not too bad. I'm unsure about the price, but I think it was about R92.95 at Dischem. So that's my favourites for June! Which products got you excited this past month? Let me know in the comments section. On Monday I let you in on a few of my winter favourites concerning skincare which you can read here. This post continues on that theme and contains a few of my favourite haircare, body care, and hand and nail care products for winter. I don't really change my hair care routine all that much during winter, but I do spend more time using my hairdryer, so I try to use more heat styling products (that you apply before blowdrying) and hair oils mid blow-dry. I also try and incorporate hair masks into my routine, but only when I feel my hair needs it. 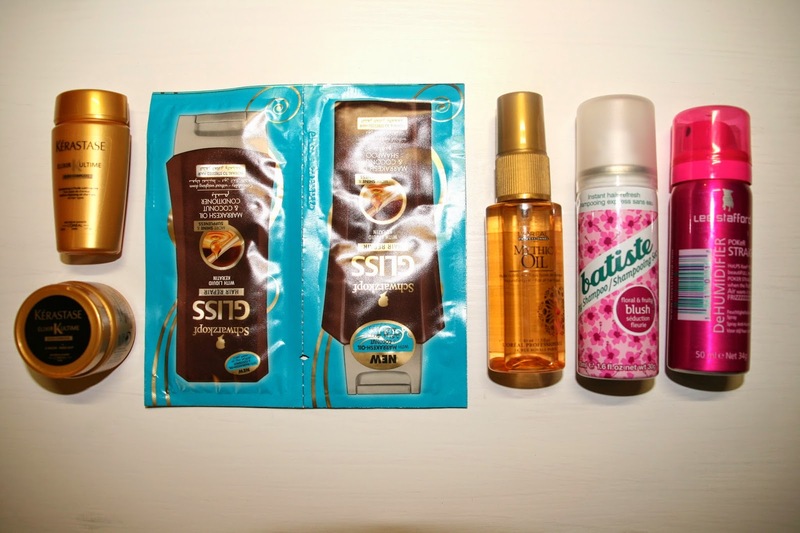 Favourites include Dove's Nourishing Oil Care Deep Repair Treatment Mask, Aussie's 3 Minute Miracle Luscious Long Deep Treatment, L'Oreal Mythic Oil, and Kérastase Elixir Ultime. This is one of the areas that need the most hydration, but which I skimp the most on. On a good day I despise applying body lotion, but in winter even more so. After my shower I just want to put on my clothes or a fluffy bath robe and be done with it, not spend time applying body lotion or body butter while getting cold again. When I'm good and it's not too cold, I like applying The Body Shop body butter. My favourites at the moment are the HoneyMania and the Blueberry scents. I also like The Beauty Factory's Body Oil (it makes you smell like clean laundry!) and Woolworths Extreme Moisture Dry Oil Spray. 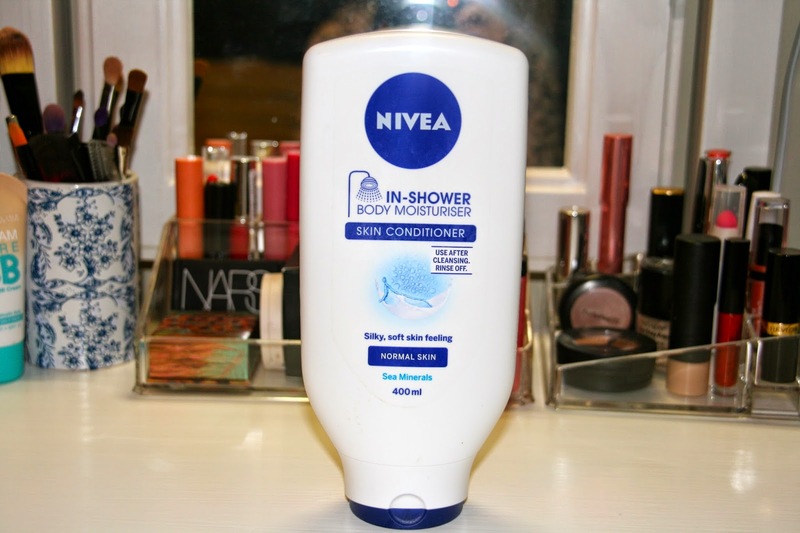 When I'm not good, I just apply a good dollop of Nivea In-Shower Body Moisturiser to my skin and rinse if off. It's not 100% as hydrating as the body butters, but it still does a good job at hydrating my skin. Apart from moisturising your skin, it's also important to regularly exfoliate to remove the dead skin cells and improve blood circulation as well as the overall appearance of your skin. My favourite body scrubs are the Soap & Glory The Breakfast Scrub (which is sadly finished), The Body Shop Blueberry body scrub, and the Rain Kalahari Melon and Honeybush Body Polish. My hands are where I feel winter the most. The back of my hands get extremely dry and become red and sore. The only things that work are to try and keep my hands out of water, and to regularly apply rich, thick hand creams. The state of my nails are also hazardous and my cuticles are extremely dry. 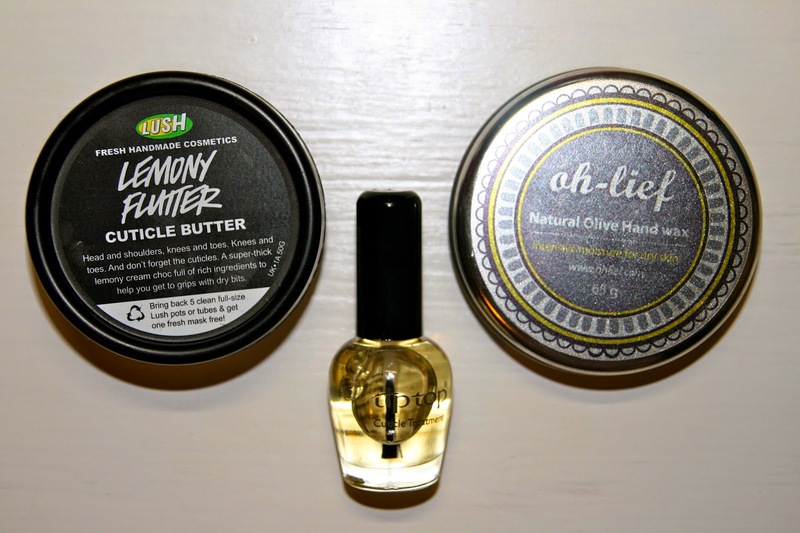 The hand creams that currently seem to work the best are the Oh-Lief Natural Olive Hand Wax and the Lush Lemony Flutter Cuticle Butter. I've also been using a lovely Blendbox hand cream sample that smells of soothing lavender, but I've since run out. When I remember I apply cuticle oil (Tip Top's Cuticle Oil) to my cuticles, but I don't like the oily feeling of it, so I usually just apply a thick hand cream and let that sink in. 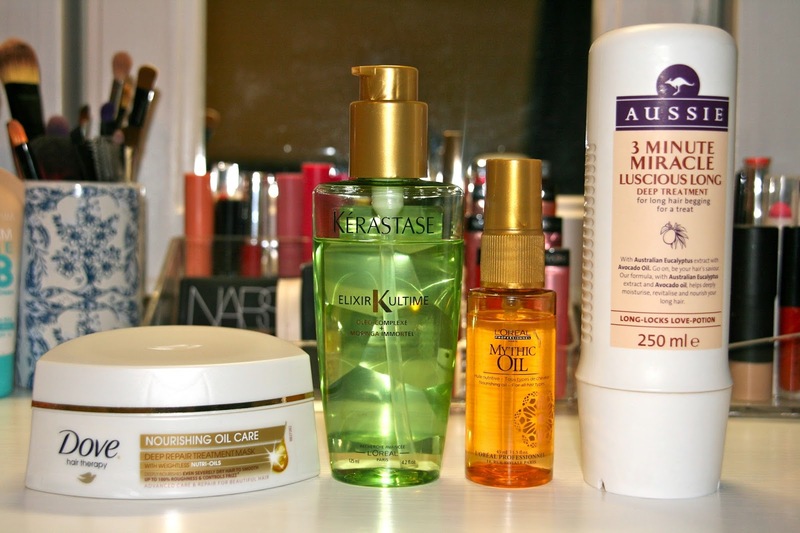 What are your favourite haircare and body care products? Let me know! I thought I would give the next few posts a winter flavour seeing as we are now properly in the coldest season of the year. I am personally not the biggest fan of winter as I struggle with the cold, but I've been finding ways of making it more bearable, and even quite enjoyable, for myself. This post will focus on skincare as I feel it is important to take extra care of yourself during the winter months. Where I live, the winter is cold and dry, and the dry air really wreaks havoc with your skin. I am a big fan of hot cloth cleansing and to me it's the perfect cleansing method for winter as it gives your skin a gentle exfoliation as well as a fantastic spa-like experience every time you wash your face. I like to use balms and rich cleansers as it leaves my skin smooth, supple, and well hydrated. 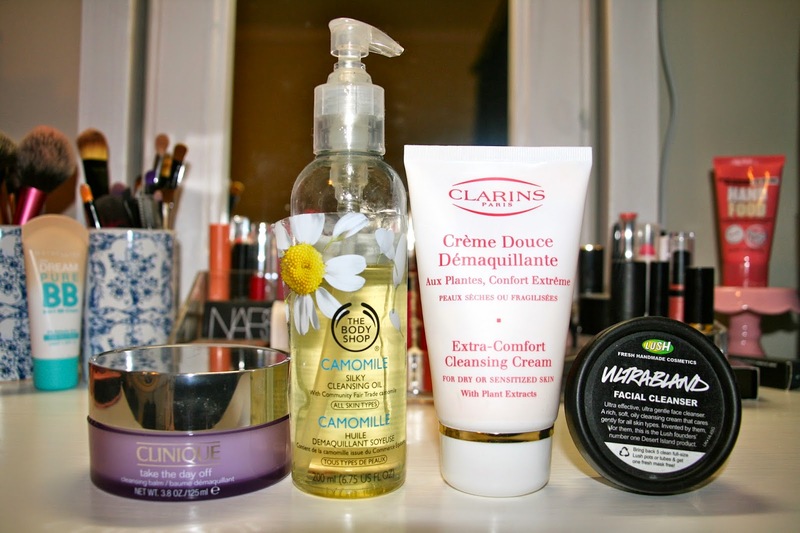 My current favourites include Clinique Take The Day Off Cleansing Balm, The Body Shop Cleansing Oil, Clarins Extra-Comfort Cleansing Creal, and Lush Ultrabland. I have combination oily skin but my skin gets dehydrated easily, so I make sure to use hydrating toners (such as The Body Shop's Vitamin E Hydrating Toner) and a serum containing Hyaluronic acid to boost moisture (I currently use Woolworths Treat Anti-ageing Serum). 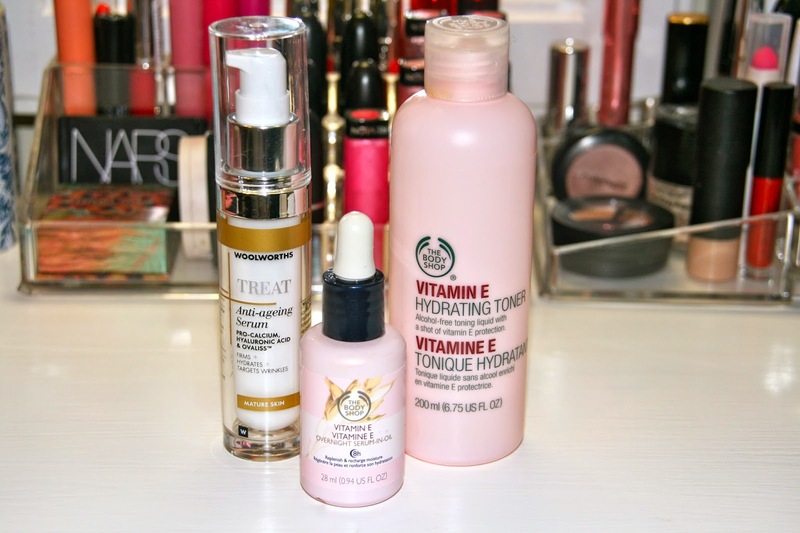 For evenings I like using The Body Shop Vitamin E Overnight Serum-in-oil underneath my moisturiser. 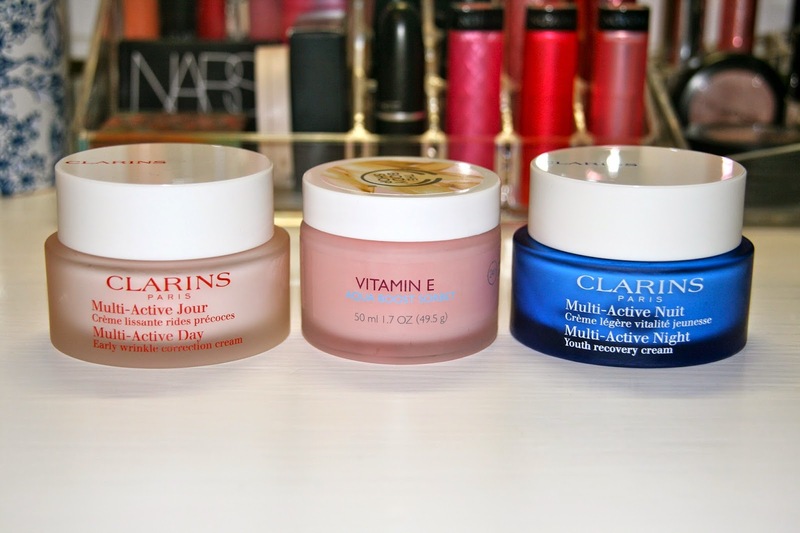 My moisturisers of choice are the Clarins Multi-Active Day cream and The Bodyshop Vitamin E Aqua Boost Sorbet for mornings, and the Clarins Multi-Active Night cream at night. I also use a lot of hydrating masks to replenish my skin's moisture. If I use a purifying clay mask I'll always follow it up with a hydrating mask. 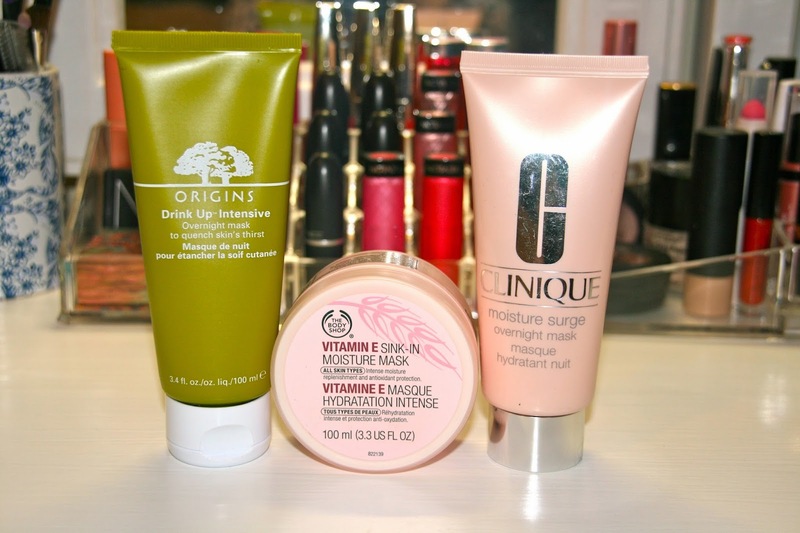 I enjoy using the Origins Drink Up Intensive Overnight mask, The Body Shop Vitamin E Sink-In Moisture Mask, and the Clinique Moisture Surge Overnight mask. My lips always tend to get very dry and chapped at this time of year. I slap on a thick layer of The Body Shop's Aloe Lip Care or Oh Lief's Natural Lip Balm. 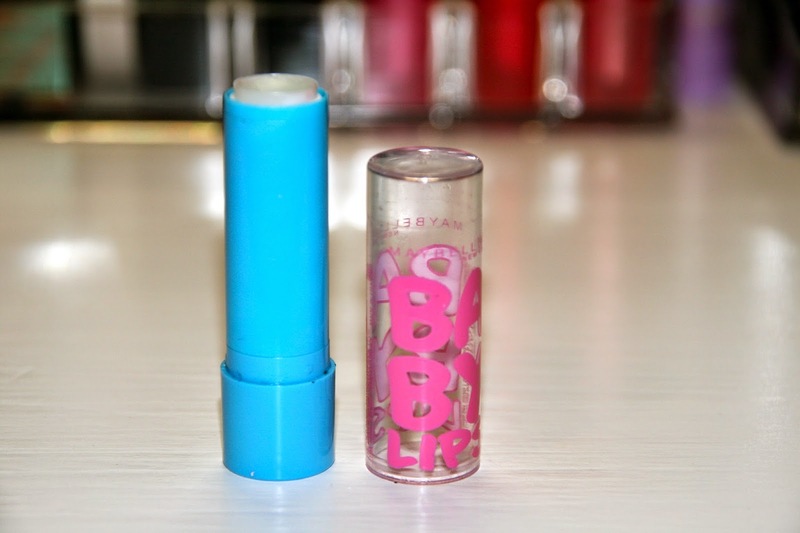 I also love the Maybelline Baby Lips range, especially the Hydrate variant. My current favourite is Cherry Me which smells like cherries and moisturises my lips nicely. How does your beauty routine change in winter? Let me know in the comments section! 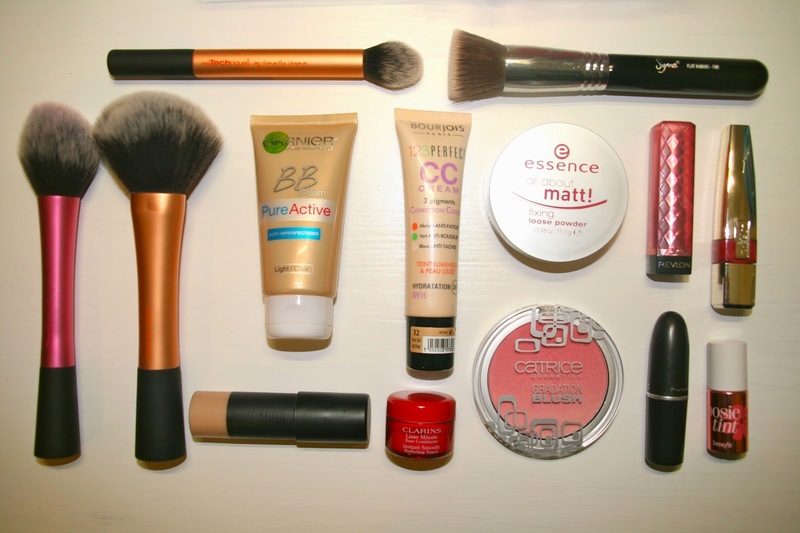 Last week on Instagram I asked how fellow beauty blog readers feel about empties posts, and if I should do one. The general feeling was very positive, so I decided to give it a bash. 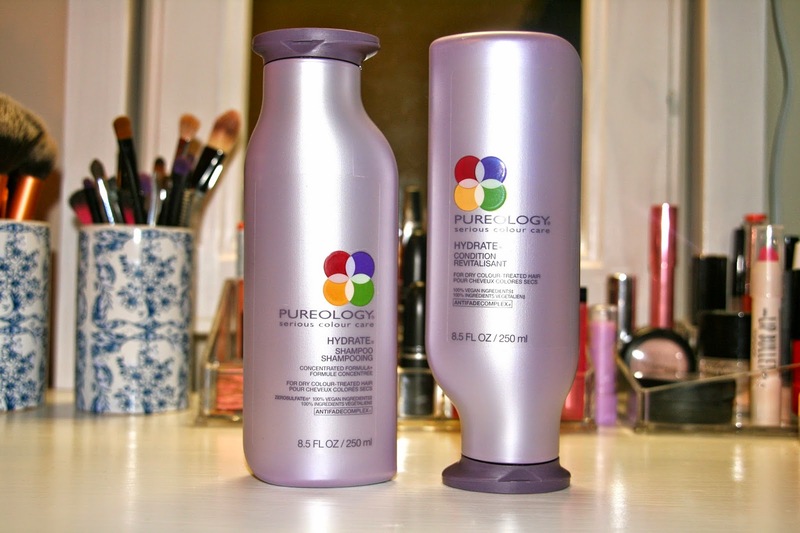 I personally love empties posts because I love to hear the blogger's thoughts on the product, but also if she would repurchase the product or not. That, to me, is the ultimate product review. This is my first empties post and definitely not the last, as I am a bit OCD when it comes to finishing things! I have randomly selected eight (!) 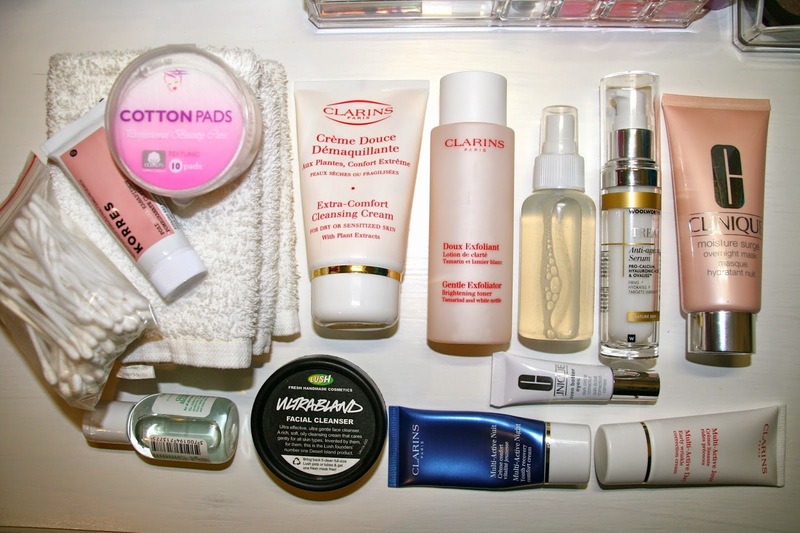 products from my bag of empties to feature in this post. Let's get started! * Definitely! This is in fact my second tube, with a third tube well on its way. * The price (it is quite pricey, and you could easily get an equally good scrub for less). * Yes (the smell and the experience of using Soap & Glory is just too amazing to pass up!). * The smell: some say it smells like strawberry milkshake, but I think it's more of a minty strawberry smell. * It makes my hair super soft and smell incredible for the entire day. * The price: depending on the size, this conditioner costs anywhere between R80 and R230. * Not really readily available: you either need to go to a Lush store (there are currently only three in the country), or you need to order it online and the delivery cost is absurdly high. * Maybe... I do like the smell of the conditioner and the way it leaves my hair silky soft, but I think you can purchase an equally great conditioner for much less. * It's VERY thick...I have to soak my face cloth overnight in soapy water to get it all out. * Yes! I am already on my second tub. * The smell is amazing: wild flowers mixed with honey. The scent is soft and sweet and lingers. * The body butter is, in my opinion, more creamy than the other body butters. * It sinks into the skin very easily and leaves your skin silky soft. 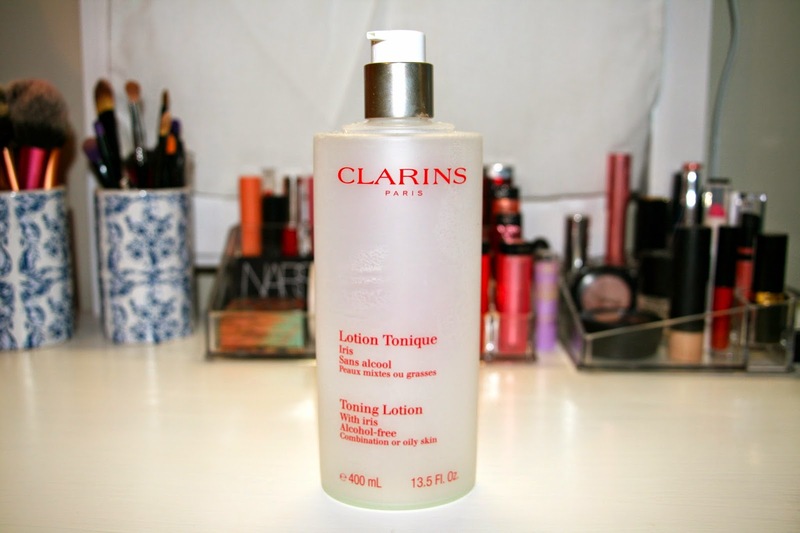 * It's a toner, not much I can say about it except that it seems to go perfectly with the rest of my (mostly) Clarins skincare routine. * I love the big 400 ml bottle because it lasts for ages (I got this on a promotion, it costs less than buying two 200 ml bottles). * The pump dispenser is super convenient. * Yes, as soon as the 400 ml promotion hits stores again, and when I finish my current toners. * Yes yes and yes! It wasn't voted top cleanser by Elle magazine for nothing! It was mentioned in my April favourites post that you can read here, and I will definitely be stocking up as soon as the rest of my stash is finished. 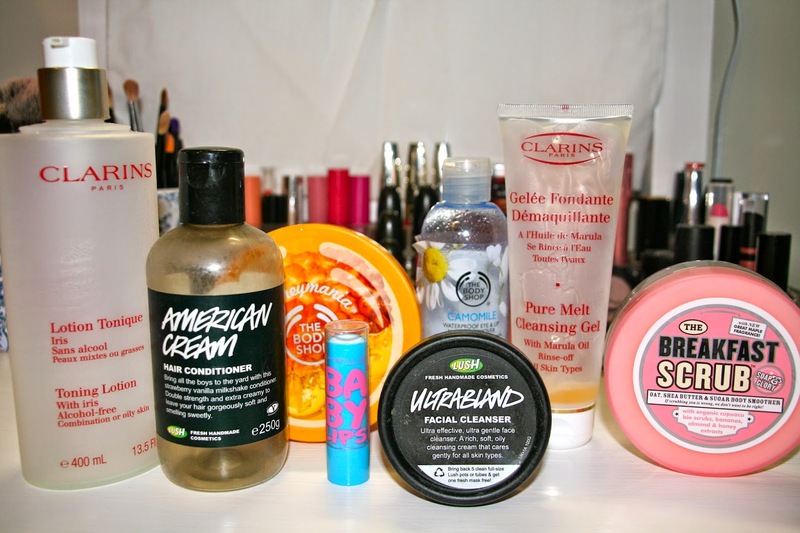 And that's it for the first empties post! Have you ever tried any of these products before? What did you think? Let me know in the comments section. When I went to Cape Town earlier this month, I made a quick stop at Lush in the Waterfront (you can read my travel posts here and here). I had a list of things that I wanted, but then I got overwhelmed by the sights and smells and ended up getting more things than I should have. Sound familiar? I think that happens to everyone who goes into Lush! I don't go to Lush very often, I think maybe every six months or so, so if you divide everything I bought by six…that's not a lot of product per month, right? I have heard so many great things about this cuticle butter (and only while typing this do I realise the name rhymes...). It's a thick pale yellow cream, and if I say thick I mean thick! You only need the tiniest amount for your cuticles, and my word, it does work wonders! This is so far the only product I've actually used from my haul (I like to look at and smell my Lush products for weeks before using them. That's normal, right? Right?) and I am converted. 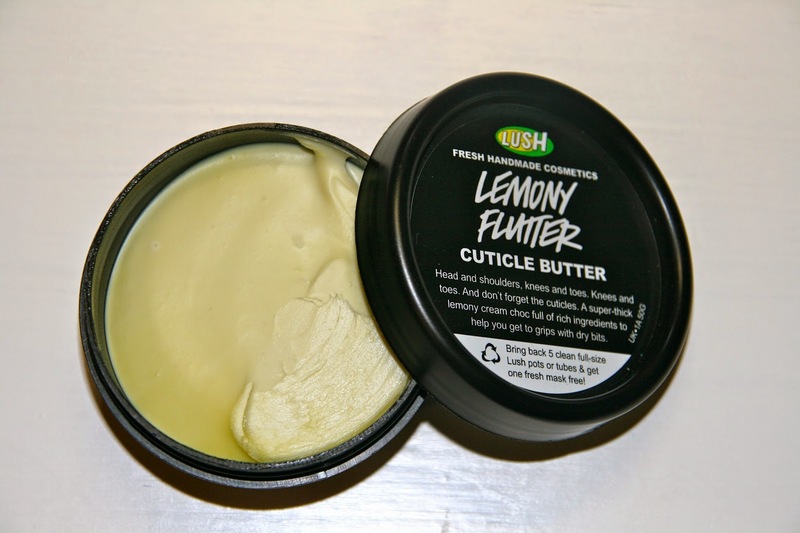 It smells of lemons and makes your cuticles (and any other dry areas) smell amazing as well as making them completely soft. R105 is quite a lot for a little tub, but I don't think I'll ever be able to use this up! 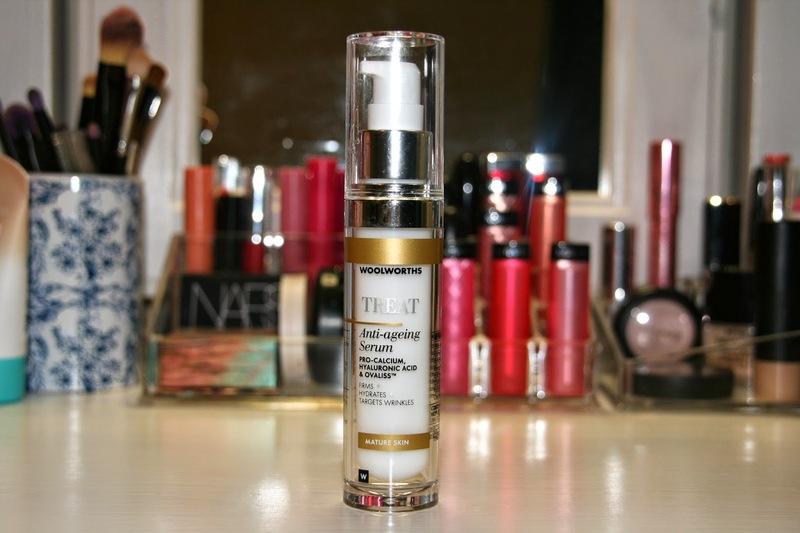 This was the number one product on my list to buy as I heard a lot of beauty bloggers raving about it. For those of you who don't know: this is a shower gel in jelly form. 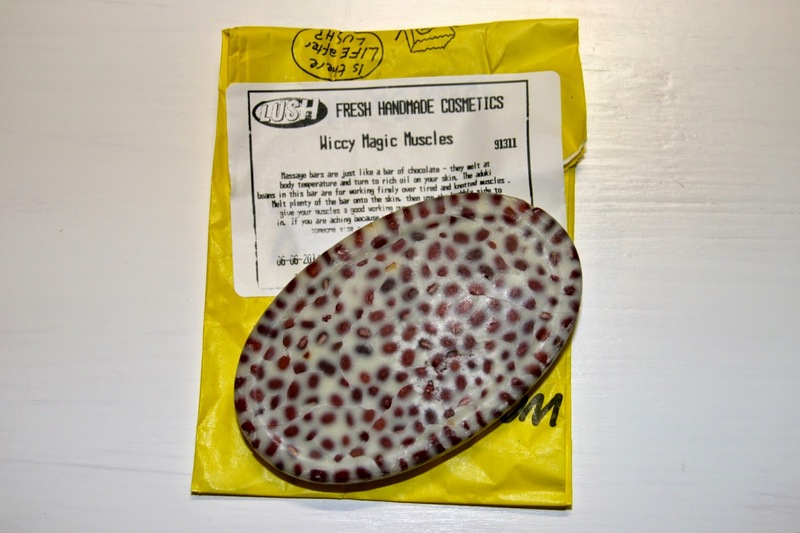 As the label reads: "If a bar of soap and a bottle of shower gel had a steamy affair, this would be the resulting jelly, baby." 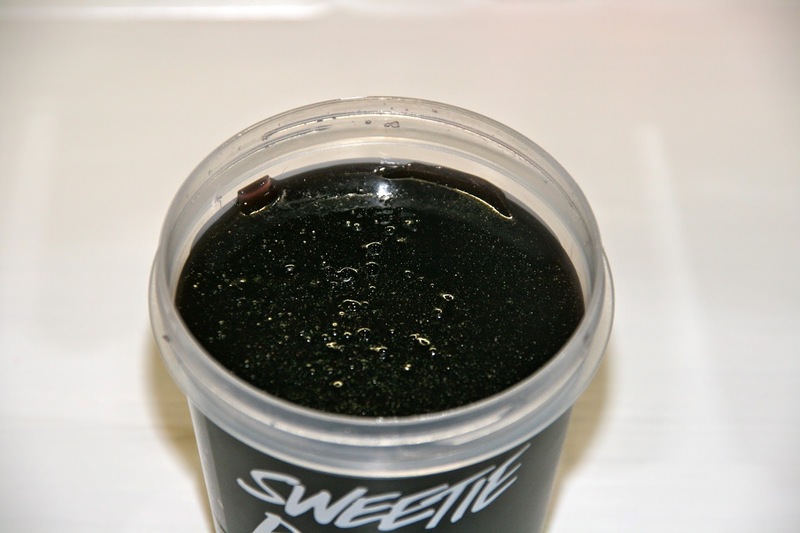 It smells like super sweet blackcurrant and contains cherries, coconut, jelly, and sparkles. I haven't used it yet as I still get distracted by the smell and the weirdness of it. Also, I haven't decided how to use it, but I think I'll cut it into blocks. Any suggestions? This is my only repurchase. The one I have is still in use, but I'm scared that I won't be able to get my hands on another one. This is a massage lotion/oil in solid form and contains a host of amazing oils, with cinnamon leaf oil being the star ingredient. The underside of the massage bar is smooth and you rub that across the skin until it starts to melt. You then turn the bar over and massage the skin with the knobbly side that contains aduki beans. The smell is amazing! It smells of cinnamon and cloves and is the perfect wintery scent. I also bought a tin to put this in while I finish my other massage bar. 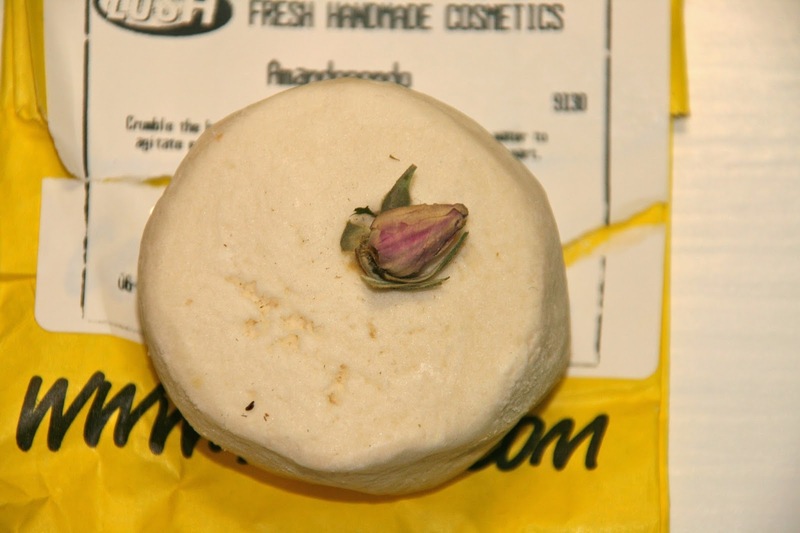 I have proclaimed my love for the Karma Komba solid shampoo bar here, and I thought I would branch out a little and try something new. 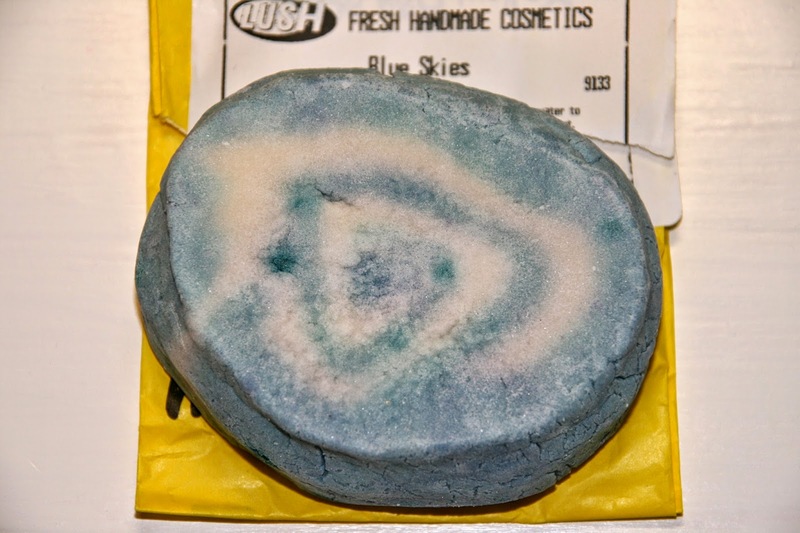 There were quite a few shampoo bars I liked, but I decided to try the blue beachy one. It smells a bit like toothpaste, but I really don't mean that in a bad way. It just has a fresh scent but doesn't smell like seawater at all. It contains sea salt, jasmine, mimosa, and orange blossom. It will apparently soften your hair, while adding shine and bounce to it. The smell of this is absolutely amazing. It smells like raspberry cooldrink meets those little pink musk sweets. 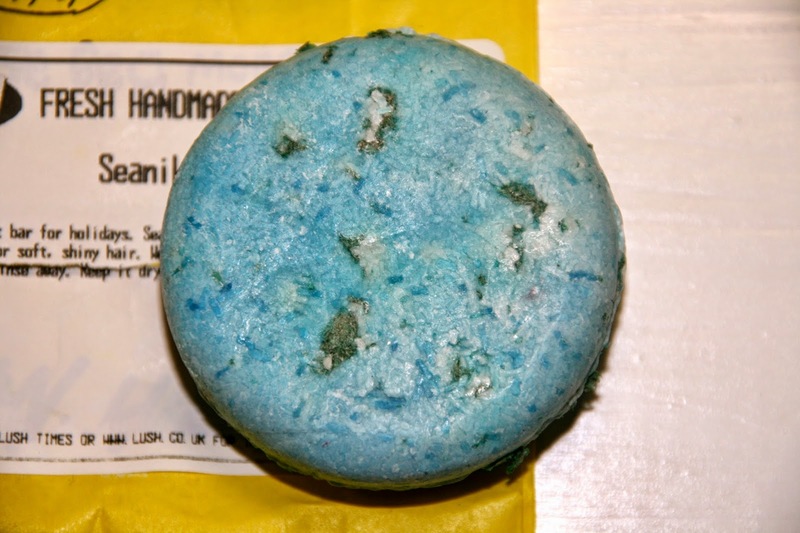 I am actually not sure if this is a bath bomb or a bubble bar, but judging by the size of this, I would imagine that you just pop it into the bath in one go. It contains marshmallow herb, cocoa butter, and marigold and apparently turns your bath into a "pink fluffy waterbed of marshmallow and moisturizing cocoa butter". Another bath product that I can't stop sniffing... This white bath bar contains rose absolute, lemon oil, and orange oil. This is the most amazing scent! I already have the Comforter bubble bar, so I decided to give the Blue Skies bubble bar a go. This bar contains patchouli and frankincense and smells absolutely amazing. I thought it would smell like a sea breeze (can you detect a sea-theme from this haul? ), but it doesn't smell like that at all. Instead it smells almost like the Wiccy Magic Muscles, but without the cinnamon. I can't wait to use this! And that's it for my splurge-y Lush haul! 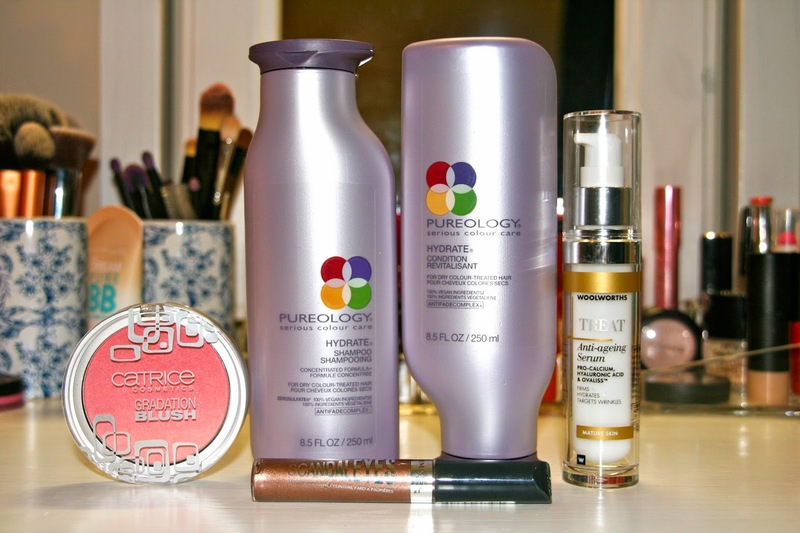 Have you used any of these products? Which are your favourites? Let me know in the comments section. The lovely folks over at Rain sent me a box of goodies to try out. This is my first experience with Rain (and their products), and I must say, I am impressed. 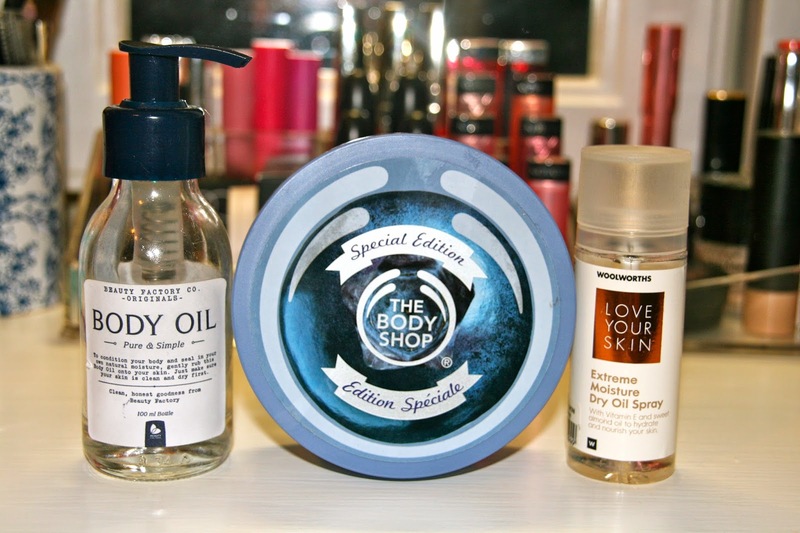 I received three items from the Biologie range and one from the Savannah range. For me, the Biologie range wins hands down in terms of packaging and fragrance. 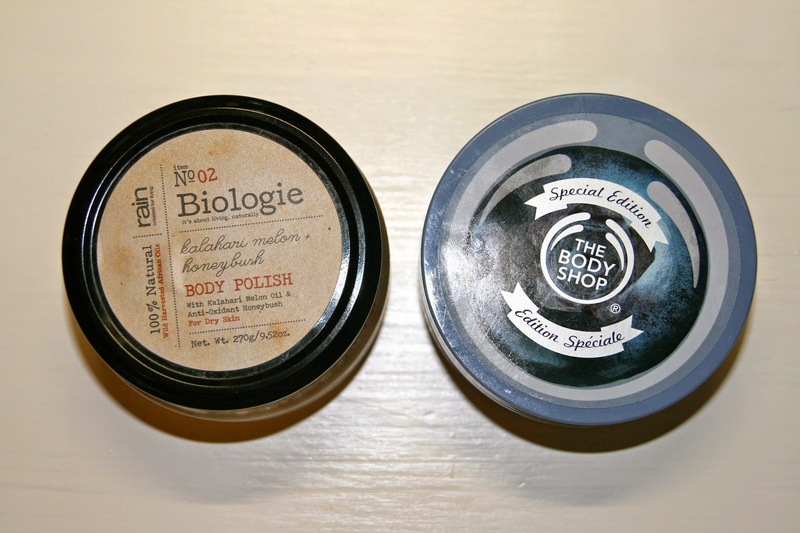 The Biologie range's packaging is predominantly dark brown with a beige vintage looking label. The first time I used this hand lotion, I applied way too much to my hands because I thought it would be a thick cream like my other hand creams. Instead it comes out as a pale pink gel cream. It smells of vanilla and not the fake vanilla smell, the real deal. It applies easily and sinks in immediately. I am quite astonished over how quickly it sinks in! It leaves my hands soft and not greasy at all. After a while the vanilla scent settles into a more Rooibossy scent. It also contains Marula oil, Kalahari melon oil, rosehip oil, and shea butter. Two things I look for in a hand cream are, 1) it must hydrate my hands and keep it hydrated, and 2) it must not leave my hands greasy. This hand lotion ticks both those boxes. Although it is a lotion, it hydrates my hands beautifully without leaving them sticky. I am not too sure if this hand cream will be rich enough for winter where the air is extremely dry up north, but so far so good! Another plus point is that the small tube fits perfectly in any handbag. This is a tricky product. When I received it, it had slowly started leaking out of the glass jar and gave the delivery box the most amazing scent. It's a salt scrub suspended in a fragrant oil. The scrub contains sea salt, honeybush tea powder, and a host of oils: sweet almond, Kalahari melon, mangosteen, lavender, and patchouli. The smell is absolutely amazing and I would love to know if there is actually anyone out there who doesn't like it! 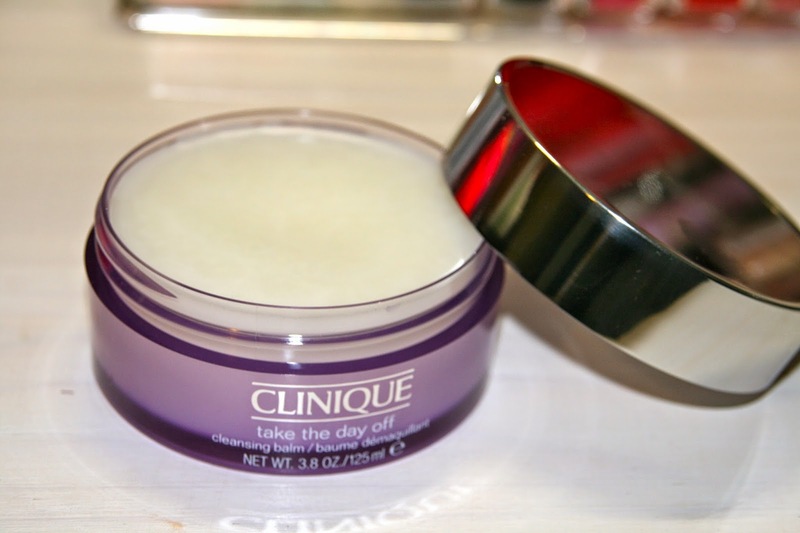 You scoop a bit of the body polish out of the jar and apply to wet skin, massage it for a bit, and rinse it off. If I had to describe the abrasiveness/scrubbiness of this, I would say it's more or less the same amount of scrubbiness as the Caribbean Tan Body Exfolia Cinnamon & Coconut scrub, although the Rain body polish contains more oil. Top tip: do not leave your oily scrub in the shower. I did that with my Caribbean Tan and the result was a very dry sugar scrub. When rinsing off the body polish, your skin is left with an oily film. I never know what the correct way is to use oily scrubs, but I like to follow up my exfoliation with a bit of shower cream/gel to remove most of the oily feeling and ensure that my skin is nice and clean. After exfoliation my skin was left incredibly smooth and supple. I didn't need to apply body lotion and the next morning my skin was still very soft. I would definitely recommend this. I love the glass jar packaging, but Rain should maybe put an "extra" lid in that you need to tear off before using the product. This is a seriously decadent body butter! It smells the same as the hand lotion, but is a thick white cream. 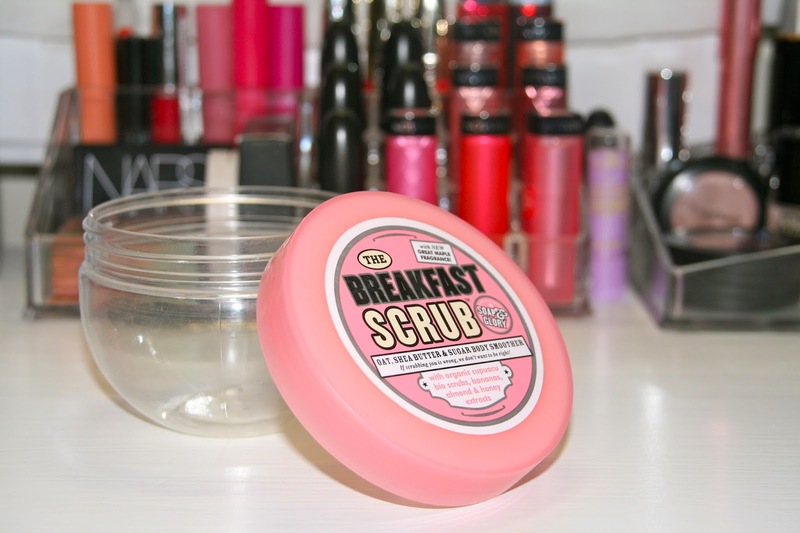 It doesn't sink into the skin as quickly as most of the other body butters that I own, so I wouldn't recommend using this in the mornings before work, especially if you're running late! I use it at night after showering and I always wake up with beautifully soft and fragrant skin. It contains Baobab oil and shea butter for intense hydration. This is really a beautiful product and I definitely recommend it. The packaging of this is very different to that of the Biologie range. The body butter comes in a see-through tub with a bronze coloured metallic lid and a modern label. This is also a thick white cream that doesn't sink into the skin that quickly, but leaves your skin wonderfully moisturised. The one thing I don't like about this is the smell. I don't know if it's just the particular tub I have, or if all of them smell like this, but it doesn't really smell like anything… According to the website this body butter is a "A fresh citrus body butter", so I will give them the benefit of the doubt on this one. Have you ever tried any Rain Africa products? Let me know in the comments section! When you read this I will be in a cold and rainy Cape Town (well the cold weather odds are high, aren't they? ), probably drinking coffee with my mom and reluctantly starting to repack my bag to return to Johannesburg tonight. On Thursday I gave you a sneak peek into my travel makeup bag, and today we'll be looking at what I packed for skincare, hair care, and body care. I'm hesitant to just randomly try out new things on my face, but for my body and hair it's fine. I don't know about you, but I have hundreds of sample packets and sample bottles lying around and this is the only time I really get to use them! 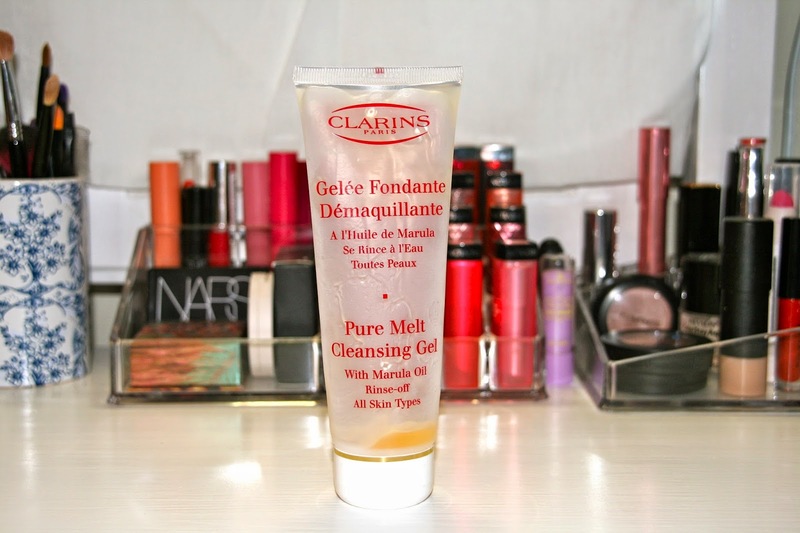 For morning cleansing I packed my Clarins Extra-Comfort Cleansing Cream. It's actually for dry and sensitised skin, but it's so gentle that anyone can use it. For nighttime cleansing I packed a small tub of Lush Ultrabland. I packed the Clarins Gentle Exfoliater Brightening Toner and decanted my The Body Shop Vitamin E Hydrating Toner into a spray bottle. I also have a lovely anti-aging serum from Woolworths which is unfortunately in a seriously non-travel bottle. Since taking this photo I have found a little tub to decant the serum into, so I'm saving a bit of space there. I also packed in a Clinique Even Better Eyes Dark Circle Corrector eye cream, and a Clarins day cream and night cream. To remove my eye makeup I decanted a bit of Bioderma Micellar Water into an empty Kiehl's toner bottle. I also packed the Korres pomegranate mask and the Clinique Moisture Surge Overnight Mask. I know I'm only going away for four days, but I normally use my masks during the weekend, and this trip falls over the weekend. Other packed essentials are earbuds, face cloths for my hot cloth cleansing, and cotton rounds. I found this cute round container at Dischem and it's amazing how many cotton rounds you can fit into it! This is where I like to experiment with the travel sizes. I always seem to accumulate shampoo and conditioner travel sizes and samples, and never really get to use them. For this trip I've packed my Schwarzkopf Gliss Marakesh Oil shampoo and conditioner samples (and for some reason they are upside down, my apologies!). I also packed in a Kérastase Elixir Ultime shampoo and conditioner which I am very excited to try out. Most of you will think that this is a lot of shampoo and conditioner for four days, but I wash my hair every day and I have long hair. I also packed my travel size L'Oreal Mythic Oil which I apply to my hair after roughly blow drying it with my fingers. I also packed a travel size Lee Stafford Dehumidifier spray (my hair does not like Cape Town's moist air), and a travel size Batiste dry shampoo in "Blush". I'm going to be quite boring here and only pack two things: a shower gel and a body butter. Scratching around in my sample drawer (yes, I have such a drawer), I came across this grapefruit liquid body cleanser from Kiehl's. 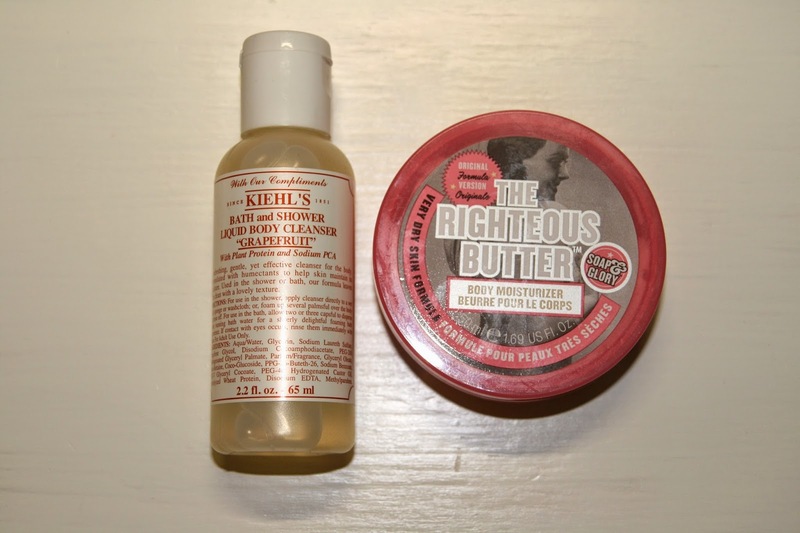 I also packed in my travel size Soap & Glory The Righteous Butter body butter. Phew, and that's the whole skincare, hair care, body care bag done! I hope you all survived this lengthy post. Let me know in the comments section what your must-haves are when you pack. Excuse the overexcited headline, but tomorrow morning I am flying home to Cape Town to go visit my family. I haven't been there since literally the first day of this year, so I am very excited! I love planning and packing for trips. As a compulsive list maker I think that's a big part of the excitement for me. I thought I'd share my excitement with you and give the next two posts on Suzy Q-tip a local travel theme. Today I will be showing you what's in my travel makeup bag, and on Monday what's in my travel skincare (and body care) bag. Right, onto the travel makeup bag. As this was the first time in months that I actually got to pack a travel makeup bag, I was a bit stumped at first as to what to take and what to leave. I've been using such a lot of amazing products that it was difficult to narrow it down to a reasonable number of products. Knowing myself, I might still take something out and include yet another lipstick or lipgloss, but let's just say the below picture is everything I'm taking with me. For priming purposes I am only packing my teeny tiny Clarins Instant Smooth Perfecting Touch primer because 1) it is the smallest bottle/tub of primer that I own, and 2) I probably won't need to use primer in the first place seeing as I am not taking a foundation. Which brings me to my BB cream and CC cream. I love the Garnier Pure Active BB Cream in "Light" (which I talked about here) as it is so easy to apply and to blend in. 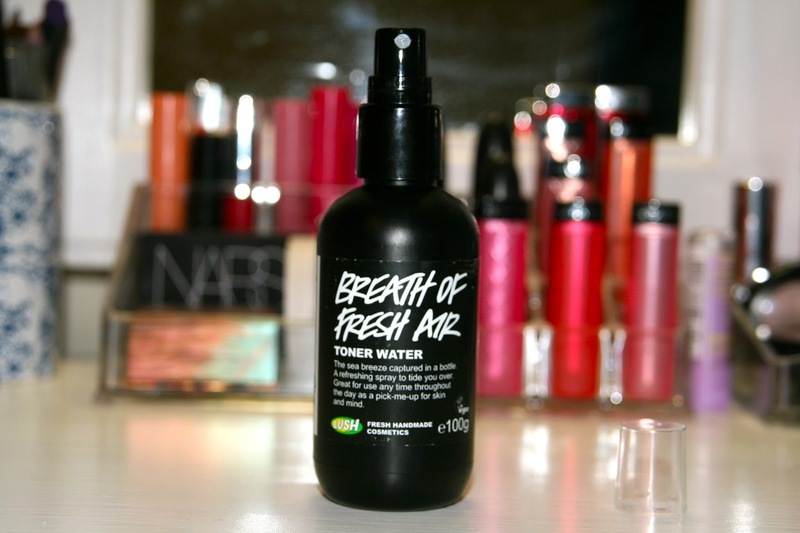 I love the smell and I love the fact that it contains 2% salicylic acid to keep blemishes at bay. For days when I might need something to hide red cheeks and a very red nose, the Bourjois CC cream in Shade 32 "Fair" will come in handy. Normally CC creams don't offer much coverage, but I was really surprised by the amount of coverage of this one! It's still light and very blendable, but it really helps in covering redness (which is one of my main concerns). To set my BB and CC creams, I use my beloved essence all about matt! loose powder. Loose powder is a biatch to travel with, and I can already see me being covered in fine white powder when I open it in Cape Town, but I'm willing to let that happen because the powder is that good! It's very finely milled and sets concealer and makeup without ever looking cakey. For cheeks I packed in the newest addition to my blush collection: the Catrice Gradation (ombre) powder blush in "Waterloo sunrise" from their Crème Fresh collection. It's soft and very pigmented, and I love the packaging! Since buying this over a week ago, it's all I've been using on my cheeks. I also packed the Benefit Posie Tint which can be used on cheeks as well as on lips. It's a bright pink liquid blush that buffs out into a lovely sheer flush on the cheeks. On the lips it is quite sheer, but looks very nice and natural. I also decided to take along my Topshop Glow Stick in "Play up" that I spoke about here. The shape and size makes it very convenient to travel with, and it adds a lovely golden glow to the skin. For lips I am taking three lipsticks: Revlon Colorburst Lip Butter in "Berry smoothie", MAC lipstick in "Syrup", and L'Oreal Colour Caresse Wet Shine Stain in "Juliette". Berry smoothie is a rich lip butter in a perfect "my lips but better" colour. The same goes for my trusty MAC Syrup. Juliette is a vibrant red, but when applied to the lips it leaves a gorgeous darkish red stain that's bold, but not as in your face as something like Stila's Liquid Lipstick in "Beso". Brush-wise I unfortunately can't pack very light. You need what you need. 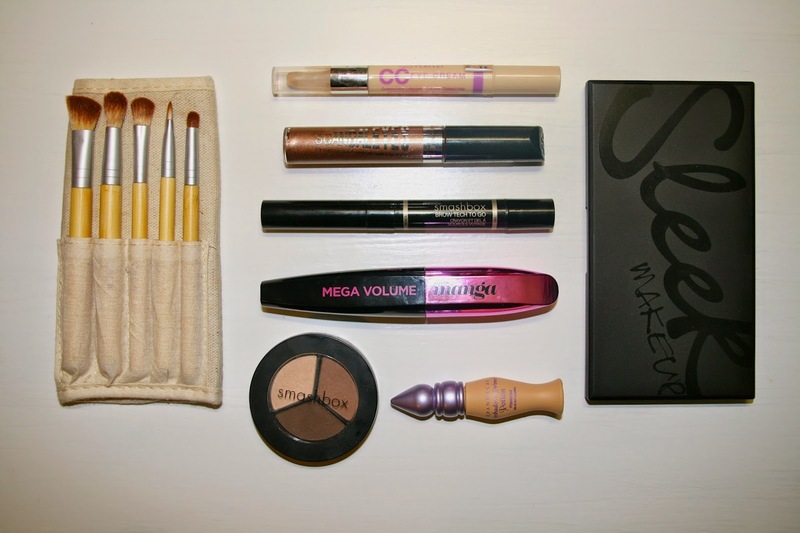 For my BB and CC creams I packed in my Sigma F80 Flat Kabuki which is an amazing brush (you can read about it here). For patting on concealer and powder in small areas, I'll use the Real Techniques Contour brush (part of the Core Collection). I also packed my Real Techniques powder and blush brushes. In the end I decided to go with a few beauty staples and then I just had to decide on the shadows. I packed the Urban Decay Eyeshadow Primer Potion in "Eden" for my eyelids, the Bourjois CC eye cream for the under eye area, and the Smashbox Brow Tech To Go in "Taupe" for my eyebrows (you can read about it here). I also packed the Smashbox eyeshadow trio in "Filter" as it contains three stunning and neutral matt shades. I finally found a Rimmel Shadow Paint in "Rich Russet" so that is definitely coming along! I absolutely adore it. It has a doe foot applicator and you literally paint the liquid eyeshadow on and then blend it out with your finger or a brush. The Sleek i-Divine eyeshadow palette in "Storm" also made its way into my makeup bag. It's a sturdy palette, contains 12 beautiful shadows, and I really don't use it often enough. You can see all the pretty colours here. For lashes I packed the L'Oreal Miss Manga mascara. I didn't want to buy it as I really have enough mascaras, but I am definitely not disappointed. 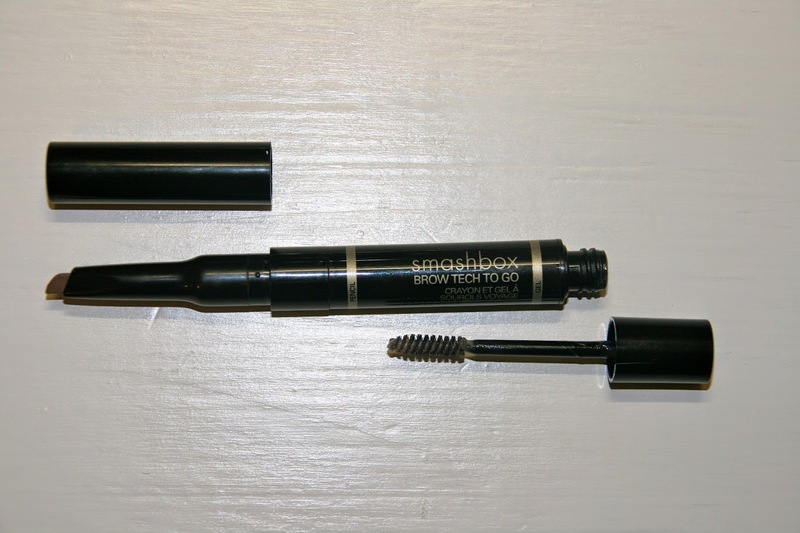 I love the packaging and the weird bendy brush, but most of all I love the way the mascara defines and coats my lashes in brilliant black. Brush-wise I am taking my Cala eyeshadow brush travel kit. It comes in a cute cloth bag with a velcro strip and houses five fluffy brushes. From a slanted eyeliner brush, to a base shadow brush, to a fluffy blending brush, this little kit has it all. There you have it, ladies! Quite a long post for a four day makeup bag, eh? Thanks for reading and I'd love to know what you think about my products in the comments section. Stop by on Monday for the rest of my packing adventure! Another month done and dusted, cue hyperventilation! This month features mostly skincare products and only one makeup item. 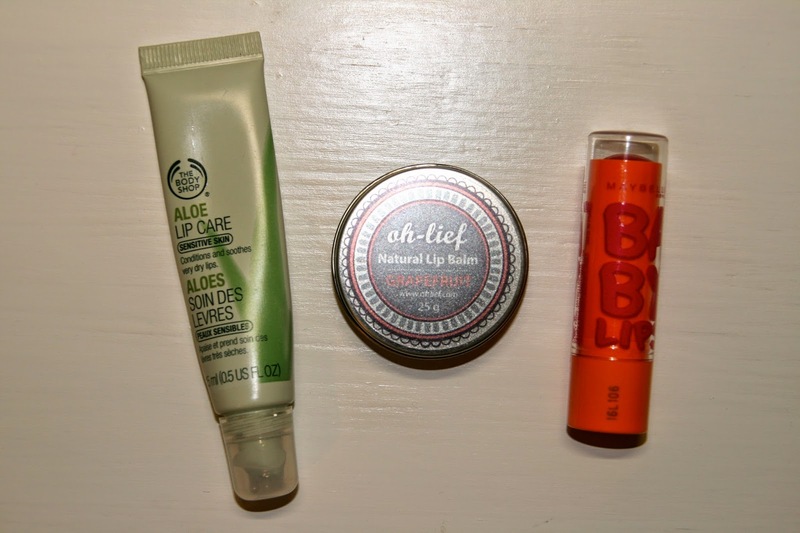 I've actually still been using a lot of last month's favourites, so these are just the "new" favourites. Let's get stuck in, yes? 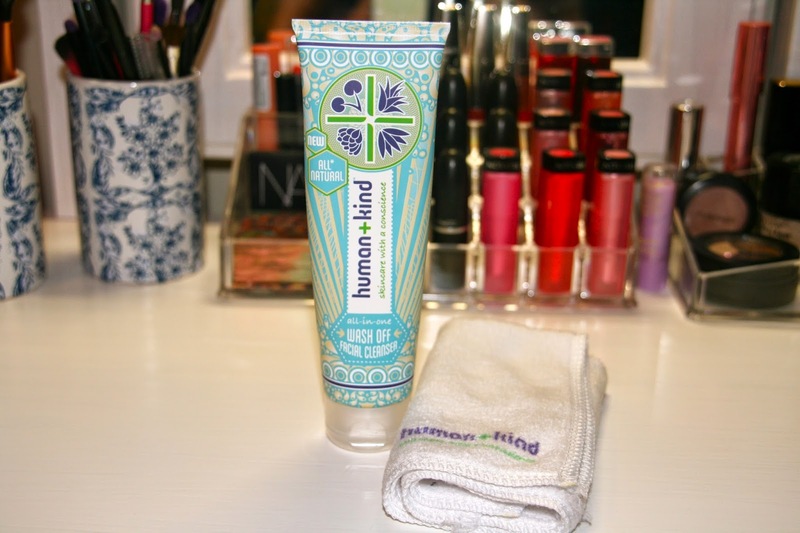 I've really enjoyed using this balm cleanser at night to remove my makeup before going in with a second cleanser. It's a solid balm that you apply to dry (dirty) skin before removing it with a warm face cloth. 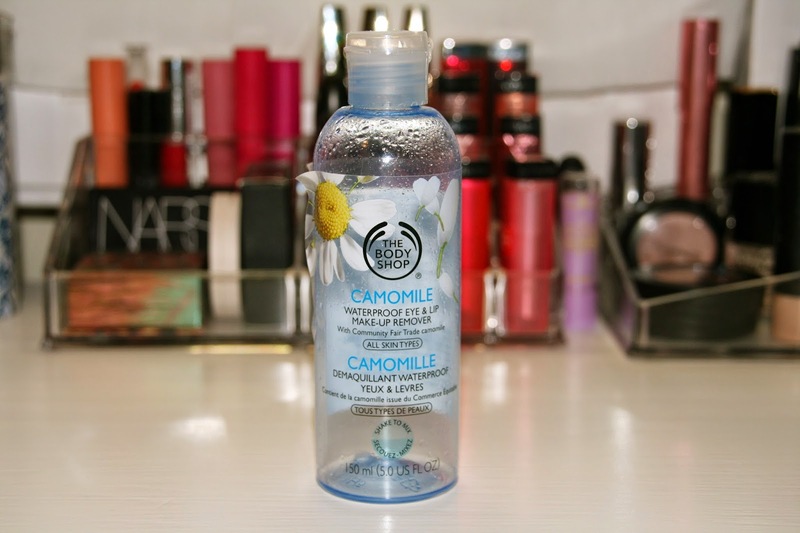 It removes makeup effortlessly and feels silky on the skin. You can read my review of it here. 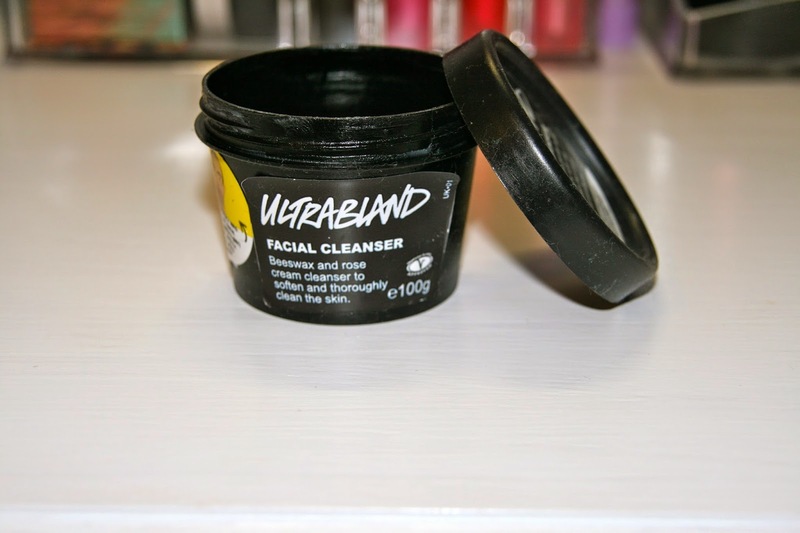 Staying with cleansers, we have the Human+Kind cleanser that I read about on All Dolled Up. When you buy this all natural facial cleanser you get a super soft deep-cleansing face cloth with it. You can also buy a twin pack of these face cloths separately. The cleanser has a strong herby smell and doesn't have as much slip as normal cream cleansers. I like to use this in the morning and it feels nice and refreshing. It does make my skin slightly tight when I take too long to apply toner and moisturiser, but all in all I like the herby smell and the way it cleanses my skin. The face cloths are so soft and gentle. I actually prefer using these face cloths with more creamy cleansers as I find that the Human+Kind cleanser doesn't have that much slip. It feels like these face cloths retain the heat of hot water better, but that might just be my imagination. The third skincare product is one that I've been using for months (and is actually now empty, with a new one waiting on the bathroom shelf). 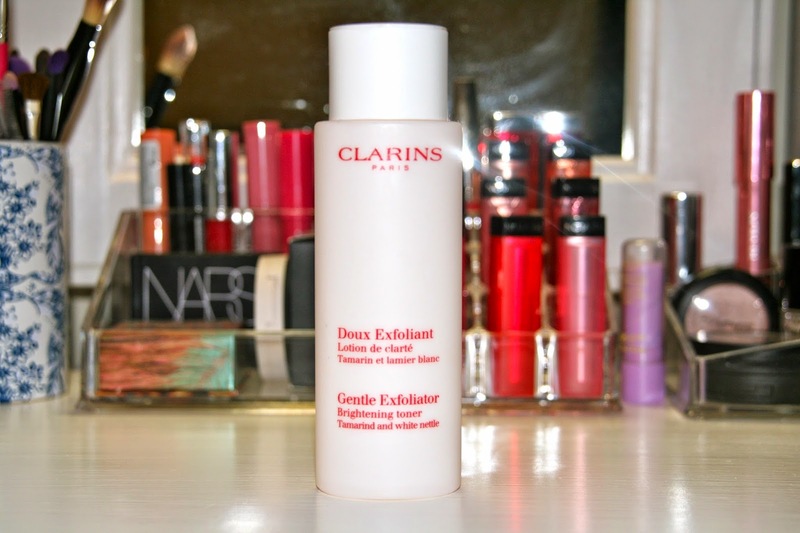 The Clarins exfoliating toner is just what it says: a toner that gently exfoliates your skin without the need to wash it off. I've heard you should only use this once or twice a week, but I use it every night (and no, my face hasn't fallen off yet!). 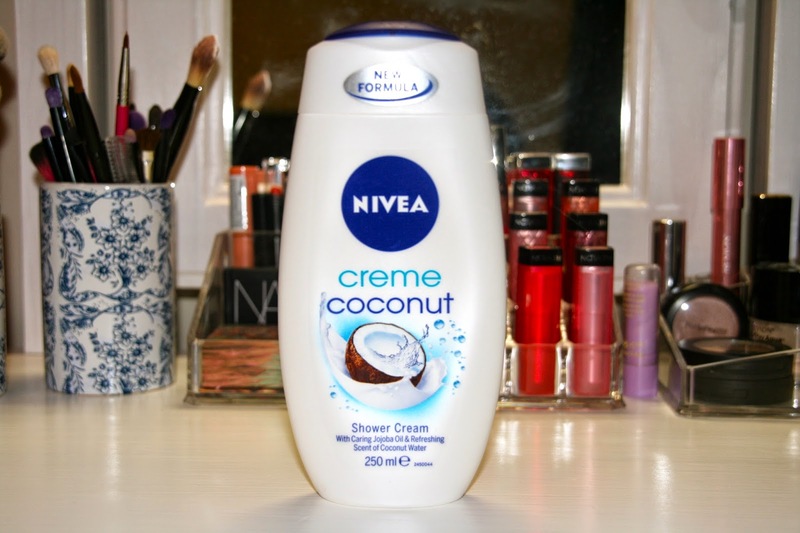 I absolutely adore Nivea's bath and shower products. They smell so good and are very moisturising. The latest offering in the shower cream department comes in the form of pure coconutty goodness. The scent is not overpowering, I think even people who don't like coconut might like this. The last favourite for the month is an eyebrow product, strangely enough. I never really know what to do with my brows. I either look like I don't really have eyebrows, or I end up looking like Frida Kahlo. But this little pen thingy has changed all that. The one end is a twisty triangle-shaped crayon that isn't too soft and buttery, but not too hard and scratchy either. The other end is a tiny spoolie (yay for tiny spoolies!) with gel. Perfect for on the go as you only need to take one product with you. I have it in "Taupe". So that was May's favourites! 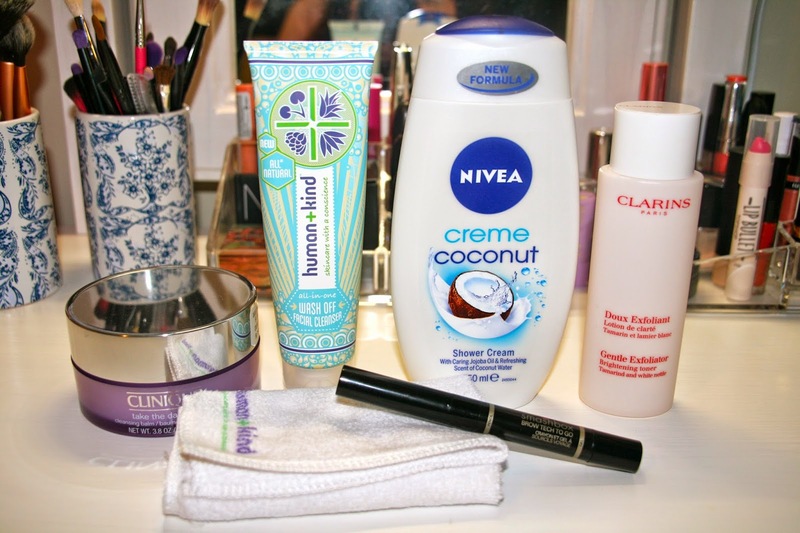 Have you ever used any of these products?